Worked on a WordPress project all night, the night before last. Was able to put together a preliminary version of a syllabus database that I’ve been meaning to build for an academic association with which I’m working. There are some remaining bugs to solve but, I must say, I’m rather pleased with the results so far. In fact, I’ve been able to solve the most obvious bugs rather quickly, last night. More importantly, I’ve learnt a lot. And I think I can build a lot of things on top of that learning experience. Part of the inspiration comes from Kyle Jones’s blogpost about a “staff directory”. In addition, Justin Tadlock has had a large (and positive) impact on my learning process, either through his WordPress-related blogposts about custom post types and his work on the Hybrid Theme (especially through the amazing support forums). Not to mention WordCamp Montreal, official documentation, plugin pages, tutorials, and a lot of forum– and blogposts about diverse things surrounding WordPress (including CSS). I got a lot of indirect help and I wouldn’t have been able to go very far in my project without that help. But, basically, it’s been a learning experience for me as an individual. I’m sure more skilled people would have been able to whip this up in no time. So, how did I achieve this? Well, through both plugins and theme files. To create this database, I’ve originally been using three plugins from More Plugins: More Fields, More Taxonomies, and More Types. Had also done so in my previous attempt at a content database. At the time, these plugins helped me in several ways. But, with the current WordPress release (3.2.1), the current versions of these plugins (2.0.5.2, 1.0.1, and 1.1.1b1, respectively) are a bit buggy. In fact, I ended up coding my custom taxonomies “from scratch”, after running into apparent problems with the More Taxonomies plugin. Eventually did the same thing with my “Syllabus” post type, replacing More Types. Wasn’t very difficult and it solved some rather tricky bugs. Naïvely, I thought that the plugins’ export function would actually create that code, so I’d be able to put it in my own files and get rid of that plugin. But it’s not the case. Doh! Unfortunately, the support forums don’t seem so helpful either, with many questions left unanswered. So I wouldn’t really recommend these plugins apart from their pedagogical value. Besides the More Plugins, I’m only using two other plugins: Jonathan Christopher’s Attachments and the very versatile google doc embedder (gde) by Kevin Davis. Attachments provides an easy way to attach files to a post and, importantly, its plugin page provides usable notes about implementation which greatly helped me in my learning process. I think I could code in some of that plugin’s functionality, now that I get a better idea of how WordPress attachments work. But it seems not to be too buggy so I’ll probably keep it. As its name does not imply, gde can embed any file from a rather large array of file types: Adobe Reader (PDF), Microsoft Office (doc/docx, ppt/pptx/pps, xsl/xslx), and iWork Pages, along with multipage image files (tiff, Adobe Illustrator, Photoshop, SVG, EPS/PS…). 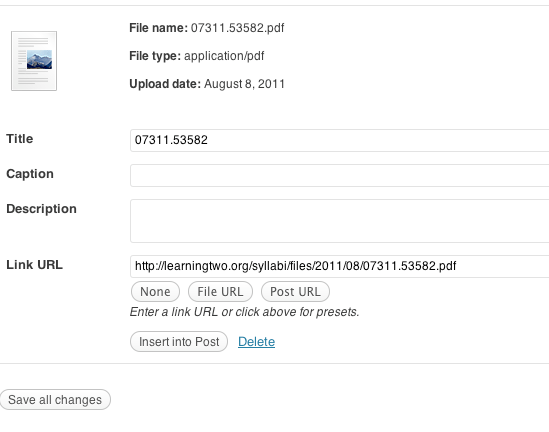 The file format support comes from Google Docs Viewer (hence the plugin name). In fact, I just realized that GDV supports zip and RAR archives. Had heard (from Gina Trapani) of that archive support in Gmail but didn’t realize it applied to GDV. Tried displaying a zip file through gde, last night, and it didn’t work. Posted something about this on the plugin’s forum and “k3davis” already fixed this, mentioning me in the 2.2 release notes. Allowing the display of archives might be very useful, in this case. It’s fairly easily to get people to put files in a zip archive and upload it. In fact, several mail clients do all of this automatically, so there’s probably a way to get documents through emailed zip files and display the content along with the syllabus. So, a cool plugin became cooler. As it so happens, gde is already installed on the academic site for which I’m building this very same syllabus database. In that case, I’ve been using gde to embed PDF files (for instance, in this page providing web enhancements page for an article in the association’s journal). So I knew it could be useful in terms of displaying course outlines and such, within individual pages of the syllabus database. What I wasn’t sure I could do is programmatically embed files added to a syllabus page. In other words, I knew I could display these files using some shortcode on appropriate files’ URLs (including those of attached files). What I wasn’t sure how to do (and had a hard time figuring out) is how to send these URLs from a field in the database: I knew how to manually enter the code, but I didn’t know how to automatically display the results of the code when a link is entered in the right place. The reason this matters is that I would like “normal human beings” (i.e., noncoders and, mostly, nongeeks) to enter the relevant information for their syllabi. One of WordPress’s advantages is the fact that, despite its power, it’s very easy to get nongeeks to do neat things with it. I’d like the syllabus database to be this type of neat thing. The Attachmentsplugin helps, but still isn’t completely ideal. It does allow for drag-and-drop upload and it does provide a minimalist interface for attaching uploaded files to blogposts. In the first case, it’s just a matter of clicking the Attach button and dropping a file in the appropriate field. In the second case, it’s a matter of clicking another Attachbutton. The problem is between these two Attach buttons. The part of the process between uploading the file and finding the Attach button takes several nonobvious steps. After the file has been uploaded, the most obvious buttons are Insert into Post and Save all changes, neither of which sounds particularly useful in this context. But Save all changes is the one which should be clicked. To get to the second Attach button, I first need to go to the Media Library a second time. Recently uploaded images are showing. For other types of files, I then click All Types, which shows a reverse chronological list of all recently uploaded files (older files can be found through the Search Media field). I then click on the Show link associated with a given file (most likely, the most recent upload, which is the first in the list). Then, finally, the final Attach button shows up. Clicking it, the file is attached to the current post, which was the reason behind the whole process. Thanks to both gde and Attachments, that file is then displayed along with the rest of the syllabus entry. It only takes a matter of seconds to minutes, to attach a file (depending on filesize, connection speed, etc.). Not that long. And the media library can be very useful in many ways. But I just imagine myself explaining the process to instructors and other people submitting syllabi for inclusion the the database. A much easier process is the one of adding files by pasting a file URL in a field. Which is exactly what I’ve added as a possibility for a syllabus’s main document (say, the PDF version of the syllabus). Passing that URL to gde, I can automatically display the document in the document page, as I’m doing with attachments from the media library. The problem with this, obviously, is that it requires a public URL for the document. The very same “media library” can be used to upload documents. In fact, copying the URL from an uploaded file is easier than finding the “Attach” button as explained previously. But it makes the upload a separate process on the main site. A process which can be taught fairly easily, but a process which isn’t immediately obvious. I might make use of a DropBox account for just this kind of situation. It’s also a separate process, but it’s one which may be easier for some people. In the end, I’ll have to see with users what makes the most sense for them. In the past, I’ve used plugins like Contact Form 7 (CF7), by Takayuki Miyoshi, and Fast Secure Contact Form (FSCF) by Mike Challis to try and implement something similar. A major advantage is that they allow for submissions by users who aren’t logged in. This might be a dealmaking feature for either FSCF or CF7, as I don’t necessarily want to create accounts for everyone who might submit a syllabus. Had issues with user registration, in the past. Like attachments, onboarding remains an issue for a lot of people. Also, thanks to yet other plugins like Michael Simpson’s Contact Form to Database (CFDB), it should be possible to make form submissions into pending items in the syllabus database. I’ll be looking into this. Another solution might be Gravity Forms. Unlike the plugins I’ve mentioned so far, it’s a commercial product. But it sounds like it might offer some rather neat features which may make syllabus submission a much more interesting process. However, it’s meant for a very different use case, which has more to do with “lead data management” and other business-focused usage. I could innovate through its use. But there might be more appropriate solutions. As is often the case with WordPress, the “There’s a plugin for that” motto can lead to innovation. Even documenting the process (by blogging it) can be a source of neat ideas. 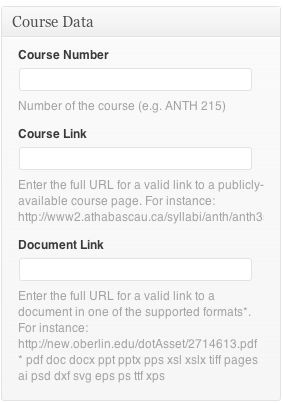 A set of ideas I’ve had, for this syllabus database, came from looking into the Pods CMS Framework for WordPress. Had heard about Pods CMS through the WordCast Conversations podcast. For several reasons, it sent me on an idea spree and, for days, I was taking copious notes about what could be done. Not only about this syllabus database but about a full “learning object repository” built on top of WordPress. The reason I want to use WordPress is that, not only am I a “fanboi” of Automattic (the organization behind WordPress) but I readily plead guilty to using WordPress as a Golden Hammer. There are multiple ways to build a learning object repository. (Somehow, I’m convinced that some of my Web developing friends that Ruby on Rails is the ideal solution.) But I’ve got many of my more interesting ideas through looking into Pods CMS, a framework for WordPress and I don’t know the first thing about RoR. Overall, Pods CMS sounds like a neat approach. Its pros and cons make it sound like an interesting alternative to WordPress’s custom post types for certain projects, as well as a significant shift from the main ways WordPress is used. During WordCamp Montreal, people I asked about it were wary of Pods. I eventually thought I would wait for version 2.0 to come out before investing significant effort in it. In the meantime, what I’ve built is a useful base knowledge of how to use WordPress as a content database. Can’t wait to finish adding features and fixing bugs, so I can release it to the academic organization. I’m sure they’ll enjoy it. Even if they don’t ever use it, I’ve gained a lot of practical insight into how to do such things. It may be obvious to others but it does wonders to my satisfaction levels. WordPress MU, BuddyPress, and bbPress on Local Machine « Disparate. More recently, I decided to get a webhost. Both to run some tests and, eventually, to build something useful. BuddyPress seems like a good way to go at it, especially since it’s improved a lot, in the past several months. In fact, the installation process is much simpler, now, and I ran into some difficulties because I was following my own instructions (though adapting the process to my webhost). So a new blogpost may be in order. My previous one was very (possibly too) detailed. This one is much simpler, technically. One thing to make clear is that BuddyPress is a set of plugins meant for WordPress µ (“WordPress MU,” “WPMU,” “WPµ”), the multi-user version of the WordPress blogging platform. BP is meant as a way to make WPµ more “social,” with such useful features as flexible profiles, user-to-user relationships, and forums (through bbPress, yet another one of those independent projects based on WordPress). While BuddyPress depends on WPµ and does follow a blogging logic, I’m thinking about it as a social platform. Once I build it into something practical, I’ll probably use the blogging features but, in a way, it’s more of a tool to engage people in online social activities. BuddyPress probably doesn’t work as a way to “build a community” from scratch. But I think it can be quite useful as a way to engage members of an existing community, even if this engagement follows a blogger’s version of a Pareto distribution (which, hopefully, is dissociated from elitist principles). But I digress, of course. 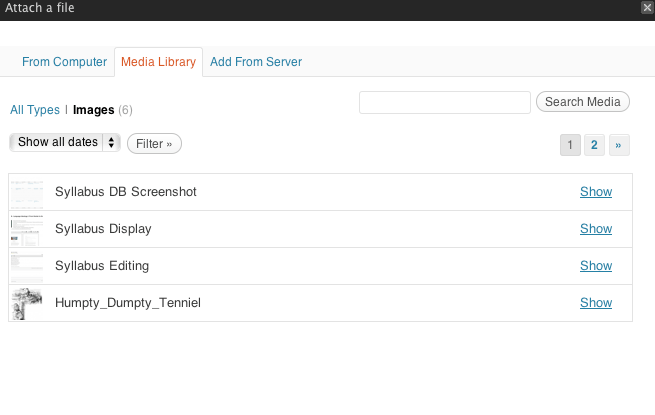 This blogpost is more about the practical issue of adding a BuddyPress installation to a webhost. Webhosts have come a long way, recently. Especially in terms of shared webhosting focused on LAMP (or PHP/MySQL, more specifically) for blogs and content-management. I don’t have any data on this, but it seems to me that a lot of people these days are relying on third-party webhosts instead of relying on their own servers when they want to build on their own blogging and content-management platforms. Of course, there’s a lot more people who prefer to use preexisting blog and content-management systems. For instance, it seems that there are more bloggers on WordPress.com than on other WordPress installations. And WP.com blogs probably represent a small number of people in comparison to the number of people who visit these blogs. So, in a way, those who run their own WordPress installations are a minority in the group of active WordPress bloggers which, itself, is a minority of blog visitors. Again, let’s hope this “power distribution” not a basis for elite theory! Yes, another digression. I did tell you to skip, if you wanted the technical details! I became part of the “self-hosted WordPress” community through a project on which I started work during the summer. It’s a website for an academic organization and I’m acting as the organization’s “Web Guru” (no, I didn’t choose the title). The site was already based on WordPress but I was rebuilding much of it in collaboration with the then-current “Digital Content Editor.” Through this project, I got to learn a lot about WordPress, themes, PHP, CSS, etc. And it was my first experience using a cPanel- (and Fantastico-)enabled webhost (BlueHost, at the time). It’s also how I decided to install WordPress on my local machine and did some amount of work from that machine. But the local installation wasn’t an ideal solution for two reasons: a) I had to be in front of that local machine to work on this project; and b) it was much harder to show the results to the person with whom I was collaborating. So, in the Fall, I decided to get my own staging server. After a few quick searches, I decided HostGator, partly because it was available on a monthly basis. Since this staging server was meant as a temporary solution, HG was close to ideal. It was easy to set up as a PayPal “subscription,” wasn’t that expensive (9$/month), had adequate support, and included everything that I needed at that point to install a current version of WordPress and play with theme files (after importing content from the original site). I’m really glad I made that decision because it made a number of things easier, including working from different computers, and sending links to get feedback. While monthly HostGator fees were reasonable, it was still a more expensive proposition than what I had in mind for a longer-term solution. So, recently, a few weeks after releasing the new version of the organization’s website, I decided to cancel my HostGator subscription. A decision I made without any regret or bad feeling. HostGator was good to me. It’s just that I didn’t have any reason to keep that account or to do anything major with the domain name I was using on HG. Though only a few weeks elapsed since I canceled that account, I didn’t immediately set out to transition to a new webhost. I didn’t go from HostGator to another webhost. But having my own webhost still remained at the back of my mind as something which might be useful. For instance, while not really making a staging server necessary, a new phase in the academic website project brought up a sandboxing idea. Also, I went to a “WordPress Montreal” meeting and got to think about further WordPress development/deployment, including using BuddyPress for my own needs (both as my own project and as a way to build my own knowledge of the platform) instead of it being part of an organization’s project. I was also thinking about other interesting platforms which necessitate a webhost. So I wanted a new webhost. I set out to do some comparison shopping, as I’m wont to do. In my (allegedly limited) experience, finding the ideal webhost is particularly difficult. For one thing, search results are cluttered with a variety of “unuseful” things such as rants, advertising, and limited comparisons. And it’s actually not that easy to give a new webhost a try. For one thing, these hosting companies don’t necessarily have the most liberal refund policies you could imagine. And, switching a domain name between different hosts and registrars is a complicated process through which a name may remain “hostage.” Had I realized what was involved, I might have used a domain name to which I have no attachment or actually eschewed the whole domain transition and just try the webhost without a dedicated domain name. Live and learn. I sure do. Loving almost every minute of it. At any rate, I had a relatively hard time finding my webhost. I really didn’t need “bells and whistles.” For instance, all the AdSense, shopping cart, and other business-oriented features which seem to be publicized by most webhosting companies have no interest, to me. I didn’t even care so much about absolute degree of reliability or speed. What I’m to do with this host is fairly basic stuff. The core idea is to use my own host to bypass some limitations. For instance, WordPress.com doesn’t allow for plugins yet most of the WordPress fun has to do with plugins. I did want an “unlimited” host, as much as possible. Not because expect to have huge resource needs but I just didn’t want to have to monitor bandwidth. I thought that my needs would be basic enough that any cPanel-enabled webhost would fit. As much as I could see, I needed FTP access to something which had PHP 5 and MySQL 5. I expected to install things myself, without use of the webhost’s scripts but I also thought the host would have some useful scripts. Although I had already registered the domain I wanted to use (through Name.com), I thought it might be useful to have a free domain in the webhosting package. Not that domain names are expensive, it’s more of a matter of convenience in terms of payment or setup. I ended up with FatCow. But, honestly, I’d probably go with a different host if I were to start over (which I may do with another project). I paid 88$ for two years of “unlimited” hosting, which is quite reasonable. And, on paper, FatCow has everything I need (and I bunch of things I don’t need). The missing parts aren’t anything major but have to do with minor annoyances. In other words, no real deal-breaker, here. But there’s a few things I wish I had realized before I committed on FatCow with a domain name I actually want to use. Something which was almost a deal-breaker for me is the fact that FatCow requires payment for any additional subdomain. And these aren’t cheap: the minimum is 5$/month for five subdomains, up to 25$/month for unlimited subdomains! Even at a “regular” price of 88$/year for the basic webhosting plan, the “unlimited subdomains” feature (included in some webhosting plans elsewhere) is more than three times more expensive than the core plan. As I don’t absolutely need extra subdomains, this is mostly a minor irritant. But it’s one reason I’ll probably be using another webhost for other projects. Other issues with FatCow are probably not enough to motivate a switch. For instance, the PHP version installed on FatCow (5.2.1) is a few minor releases behind the one needed by some interesting web applications. No biggie, especially if PHP is updated in a relatively reasonable timeframe. But still makes for a slight frustration. The MySQL version seems recent enough, but it uses non-standard tools to manage it, which makes for some confusion. Attempting to create some MySQL databases with obvious names (say “wordpress”) fails because the database allegedly exists (even though it doesn’t show up in the MySQL administration). In the same vein, the URL of the MySQL is <username>.fatcowmysql.com instead of localhost as most installers seem to expect. Easy to handle once you realize it, but it makes for some confusion. In terms of Fantastico-like simplified installation of webapps, FatCow uses InstallCentral, which looks like it might be its own Fantastico replacement. InstallCentral is decent enough as an installation tool and FatCow does provide for some of the most popular blog and CMS platforms. But, in some cases, the application version installed by FatCow is old enough (2005!) that it requires multiple upgrades to get to a current version. Compared to other installation tools, FatCow’s InstallCentral doesn’t seem really efficient at keeping track of installed and released versions. Something which is partly a neat feature and partly a potential issue is the way FatCow handles Apache-related security. This isn’t something which is so clear to me, so I might be wrong. Accounts on both BlueHost and HostGator include a public_html directory where all sorts of things go, especially if they’re related to publicly-accessible content. This directory serves as the website’s root, so one expects content to be available there. The “index.html” or “index.php” file in this directory serves as the website’s frontpage. It’s fairly obvious, but it does require that one would understand a few things about webservers. FatCow doesn’t seem to create a public_html directory in a user’s server space. Or, more accurately, it seems that the root directory (aka ‘/’) is in fact public_html. In this sense, a user doesn’t have to think about which directory to use to share things on the Web. But it also means that some higher-level directories aren’t available. I’ve already run into some issues with this and I’ll probably be looking for a workaround. I’m assuming there’s one. But it’s sometimes easier to use generally-applicable advice than to find a custom solution. Further, in terms of access control… It seems that webapps typically make use of diverse directories and .htaccess files to manage some forms of access controls. Unix-style file permissions are also involved but the kind of access needed for a web app is somewhat different from the “User/Group/All” of Unix filesystems. AFAICT, FatCow does support those .htaccess files. But it has its own tools for building them. That can be a neat feature, as it makes it easier, for instance, to password-protect some directories. But it could also be the source of some confusion. There are other issues I have with FatCow, but it’s probably enough for now. Disclaimer: I’m mostly documenting how I did it and there are some things about which I’m unclear. So it may not work for you. If it doesn’t, I may be able to help but I provide no guarantee that I will. I’m an anthropologist, not a Web development expert. A few instructions here are specific to FatCow, but the general process is probably valid on other hosts. In these instructions, straight quotes (“”) are used to isolate elements from the rest of the text. They shouldn’t be typed or pasted. I use “example.com” to refer to the domain on which the installation is done. In my case, it’s the domain name I transfered to FatCow from another registrar but it could probably be done without a dedicated domain (in which case it would be “<username>.fatcow.com” where “<username>” is your FatCow username). I started with creating a MySQL database for WordPress MU. FatCow does have phpMyAdmin but the default tool in the cPanel is labeled “Manage MySQL.” It’s slightly easier to use for creating new databases than phpMyAdmin because it creates the database and initial user (with confirmed password) in a single, easy-to-understand dialog box. So I created that new database, user, and password, noting down this information. Since that password appears in clear text at some point and can easily be changed through the same interface, I used one which was easy to remember but wasn’t one I use elsewhere. Then, I dowloaded the following files to my local machine in order to upload them to my FatCow server space. The upload can be done through either FTP or FatCow’s FileManager. I tend to prefer FTP (via CyberDuck on the Mac or FileZilla on PC). But the FileManager does allow for easy uploads. At any rate, here are the four files I transfered to my FatCow space, using .zip when there’s a choice (the .tar.gz “tarball” versions also work but require a couple of extra steps). Only the WordPress MU archive is needed to install BuddyPress. The last three files are needed for EarlyMorning, a BuddyPress theme that I found particularly neat. It’s perfectly possible to install BuddyPress without this specific theme. (Although, doing so, you need to install a BuddyPress-compatible theme, if only by moving some folders to make the default theme available, as I explained in point 15 in that previous tutorial.) Buddymatic itself is a theme framework which includes some child themes, so you don’t need to install EarlyMorning. But installing it is easy enough that I’m adding instructions related to that theme. These files can be uploaded anywhere in my FatCow space. I uploaded them to a kind of test/upload directory, just to make it clear, for me. A major FatCow idiosyncrasy is its FileManager (actually called “FileManager Beta” in the documentation but showing up as “FileManager” in the cPanel). From my experience with both BlueHost and HostGator (two well-known webhosting companies), I can say that FC’s FileManager is quite limited. One thing it doesn’t do is uncompress archives. So I have to resort to the “Archive Gateway,” which is surprisingly slow and cumbersome. At any rate, I used that Archive Gateway to uncompress the four files. WordPress µ first (in the root directory or “/”), then both Buddymatic and EarlyMorning in “/wordpress-mu/wp-content/themes” (you can chose the output directory for zip and tar files), and finally EarlyMorning-BP (anywhere, individual files are moved later). To uncompress each file, select it in the dropdown menu (it can be located in any subdirectory, Archive Gateway looks everywhere), add the output directory in the appropriate field in the case of Buddymatic or EarlyMorning, and press “Extract/Uncompress”. Wait to see a message (in green) at the top of the window saying that the file has been uncompressed successfully. These files are tweaks to make the EarlyMorning theme work with BuddyPress. Then, I had to change two files, through the FileManager (it could also be done with an FTP client). There, “Template: thematic” has to be changed to “Template: buddymatic” (so, “the” should be changed to “buddy”). That change is needed because the EarlyMorning theme is a child theme of the “Thematic” WordPress parent theme. Buddymatic is a BuddyPress-savvy version of Thematic and this changes the child-parent relation from Thematic to Buddymatic. There, on line 39, “$bp->root_domain” should be changed to “bp_root_domain()”. This change is needed because of something I’d consider a bug but that a commenter on another blog was kind enough to troubleshoot. Without this modification, the login button in BuddyPress wasn’t working because it was going to the website’s root (example.com/wp-login.php) instead of the WPµ installation (example.com/wordpress-mu/wp-login.php). I was quite happy to find this workaround but I’m not completely clear on the reason it works. Then, something I did which might not be needed is to rename the “wordpress-mu” directory. Without that change, the BuddyPress installation would sit at “example.com/wordpress-mu,” which seems a bit cryptic for users. In my mind, “example.com/<name>,” where “<name>” is something meaningful like “social” or “community” works well enough for my needs. Because FatCow charges for subdomains, the “<name>.example.com” option would be costly. With all of this done, the actual WPµ installation process can begin. The first thing is to browse to that directory in which WPµ resides, either “example.com/wordpress-mu” or “example.com/<name>” with the “<name>” you chose. You’re then presented with the WordPress µ Installation screen. Since FatCow charges for subdomains, it’s important to choose the following option: “Sub-directories (like example.com/blog1).” It’s actually by selecting the other option that I realized that FatCow restricted subdomains. The Database Name, username and password are the ones you created initially with Manage MySQL. If you forgot that password, you can actually change it with that same tool. An important FatCow-specific point, here, is that “Database Host” should be “<username>.fatcowmysql.com” (where “<username>” is your FatCow username). In my experience, other webhosts use “localhost” and WPµ defaults to that. You’re asked to give a name to your blog. In a way, though, if you think of BuddyPress as more of a platform than a blogging system, that name should be rather general. As you’re installing “WordPress Multi-User,” you’ll be able to create many blogs with more specific names, if you want. But the name you’re entering here is for BuddyPress as a whole. As with <name> in “example.com/<name>” (instead of “example.com/wordpress-mu”), it’s a matter of personal opinion. Something I noticed with the EarlyMorning theme is that it’s a good idea to keep the main blog’s name relatively short. I used thirteen characters and it seemed to fit quite well. Once you’re done filling in this page, WPµ is installed in a flash. You’re then presented with some information about your installation. It’s probably a good idea to note down some of that information, including the full paths to your installation and the administrator’s password. But the first thing you should do, as soon as you log in with “admin” as username and the password provided, is probably to the change that administrator password. (In fact, it seems that a frequent advice in the WordPress community is to create a new administrator user account, with a different username than “admin,” and delete the “admin” account. Given some security issues with WordPress in the past, it seems like a good piece of advice. But I won’t describe it here. I did do it in my installation and it’s quite easy to do in WPµ. You can also change a few other options, but these can be set at another point. Enabled. Blogs and user accounts can be created. Only user account can be created. Obviously, it’s not necessary. But in the interest of opening up the BuddyPress to the wider world without worrying too much about a proliferation of blogs, it might make sense. You may end up with some fake user accounts, but that shouldn’t be a difficult problem to solve. And do a search for “BuddyPress” as a term. The plugin you want was authored by “The BuddyPress Community.” (In my case, version 1.1.3.) Click the “Install” link to bring up the installation dialog, then click “Install Now” to actually install the plugin. Once the install is done, click the “Activate” link to complete the basic BuddyPress installation. You now have a working installation of BuddyPress but the BuddyPress-savvy EarlyMorning isn’t enabled. So you need to go to “example.com/<name>/wp-admin/wpmu-themes.php” to enable both Buddymatic and EarlyMorning. You should then go to “example.com/<name>/wp-admin/themes.php” to activate the EarlyMorning theme. You can set up a new bbPress install (“Set up a new bbPress installation”) and everything will work wonderfully in terms of having forums fully integrated in BuddyPress. It’s so seamless that I wasn’t completely sure it had worked. I especially advise you to add the Twitter RSS widget because it seems to me to fit right in. If I’m not mistaken, the EarlyMorning theme contains specific elements to make this widget look good. After that, you can just have fun with your new BuddyPress installation. The first thing I did was to register a new user. To do so, I logged out of my admin account, and clicked on the Sign Up button. Since I “allow new registrations,” it’s a very simple process. In fact, this is one place where I think that BuddyPress shines. Something I didn’t explain is that you can add a series of fields for that registration and the user profile which goes with it. The whole process really shouldn’t take very long. In fact, the longest parts have probably to do with waiting for Archive Gateway.